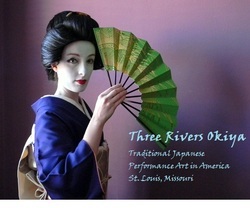 Three Rivers Okiya is a collective of independently-minded actors and historians who live and work in the St. Louis area. Their goal is to promote awareness of the Japanese traditional arts in America. They perform demonstrations of traditional dance, flower-arrangement, calligraphy, story-telling and Tea Ceremony for educational and entertainment purposes, and are honored to be returning to Kawa Kon for the fourth consecutive year.